Our sensory studio is an Aladdin’s cave of specialised equipment aimed at helping children with special needs develop a wide range of skills (and enjoy themselves in the process). We offer three 90-minute sessions every weekday, starting at 10am, 12noon and 2pm. Each session is for the exclusive use of a single family or child and carer. 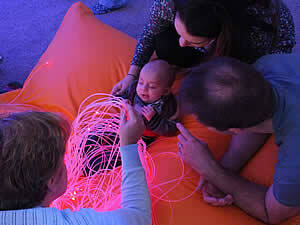 Sessions in our sensory studio are free of charge for eligible children. Under normal circumstances this means ones that are receiving Disability Living Allowance (DLA). If you would like to book a session, the first step is to register using the link on the left, which displays a form that you can fill in and submit online, or print, complete and send to us by post. Once we’ve accepted your registration you can make appointments by phone or email. In your first session we’ll show you how to use all the equipment. The studio is wheelchair accessible and has a built-in hoist.